Hospitality and Hotel CRMs help niche industries like hotels, restaurants, and event planners manage customer relationships, bookings, and events in a single platform while providing a central system to also manage marketing and operations. We identified the top six from several options based on ease of use and specialized features designed for hospitality. The hospitality industry is broad and includes several niches like restaurants, catering, event planning, hotels, travel agents, and tour operators. When considering the best CRM software, we looked at hospitality-specific as well as general use options with industry adaptable features. Our criteria included ease of use, sales and service tools, proposal and document management, and event or project management, all of which improve the customer experience. Based on these criteria, we have determined CaterZen to be the overall best hospitality CRM. It offers core CRM features like account and prospect management, reporting, and marketing. 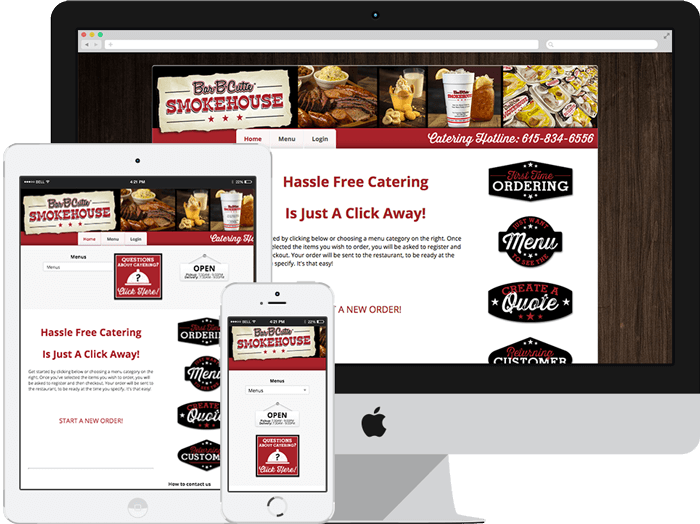 It also offers catering-specific features like menu creation, proposal templates, and order delivery management. CaterZen is the overall best hospitality CRM for its core features and industry-specific tools designed to run a foodservice business and build relationships in one platform. It’s unique because it offers VoIP for outbound calling as well as features like order delivery tracking and menu creation, making it a best for caterers and other restaurant professionals. CaterZen is affordably priced compared to other industry-specific products with pricing ranging from $129 per month for its starter package to $199 per month for its higher-end package. All plans are for unlimited users, are mobile-friendly, and offers the ability to accept credit card payments. CaterZen’s Pro tier is the starter plan priced at $129 per month. You can create unlimited menus with drag-and-drop tools and enter orders quickly with its one-page order entry. You can also create a loyalty program to promote repeat business. Its unique features are menu creation tools and recipe builders to create menus and recipes with a drag-and-drop editor. Compared to other starter plans featured, CaterZen’s plan offers a comprehensive set of specialized features. Beginning with this plan gives your catering team access to core CRM functionality with features like prospect management, account management, and sales reporting. This plan is best for catering companies wanting to manage catering specific tasks like menu creation without changing platforms to manage customer and prospect accounts. Priced at $169 per month, the Pro Plus plan builds on the Pro plan offering client self-serve tools like a customer facing, mobile-friendly online ordering site where customers can place and pay their foodservice orders. It also offers upsell and repeat order tools to help maximize revenue. Compared to the Pro plan, this plan helps caterers save time by letting customers place their own orders and make more money. The CRM features in this plan are client productivity tools that allow you to focus on getting more sales as opposed to processing them. It is, therefore, best for foodservice companies looking for tools that help catering sales teams save time while empowering customers to place their own orders. It’s also ideal for catering companies focused on repeat business and maximizing revenue at checkout. Priced at $199 per month, the Marketing Pro Plus plan builds on the Pro plan offering sales, marketing, delivery management features, email marketing tools, marketing templates, and web-to-leads forms. Additionally, it supports VoIP with click-to-call and recording features, and its delivery management features include routing, mapping, and Uber-like driver tracking. Compared Pro and Pro Plus, this plan has more sales and logistics tools. The features in this plan help caterers expand and track their sales with calling and reporting features. It also helps ensure orders arrive on time and clients can track their deliveries with driver tracking apps. Therefore, it is best for caterers looking for tools to manage all aspects of their catering business virtually. CaterZen is missing project management tools that may come in handy for those catering jobs that require more robust event management. It’s also missing lead scoring, advanced task management tools, and the ability to accommodate other hospitality sub-niches. If these features are important, caterers may want to consider Freshsales for lead scoring and task management or other more general-use CRMs featuring project and task management. CaterZen users love the software with dozens of five-star ratings on CRM and software review sites. There are some people who say setting up recipes and navigating through invoices can be a little time consuming but, overall, even this is overlooked because of how much users love the product. Catering companies or restaurant owners that need a solid hospitality CRM with catering management features should try CaterZen. It offers a 30-day free trial to evaluate its features to see if it’s right for your food business. Visit CaterZen today to learn more. Freshsales CRM is a versatile, customizable, and affordable general-purpose CRM that can adapt to serve a number of hospitality industries. It offers hospitality-friendly features like a built-in phone letting you transfer and record calls, a robust mobile app, and access to a number of integrations. This makes it a good general option for hotels, travel agencies, tour operators, and startups, or for those needing a flexible system that they can customize. Freshsales’ pricing ranges from $12 per month, per user to $49 per month, per user for paid plans geared toward small hospitality businesses. This is the most budget-friendly option of all CRMs considered. 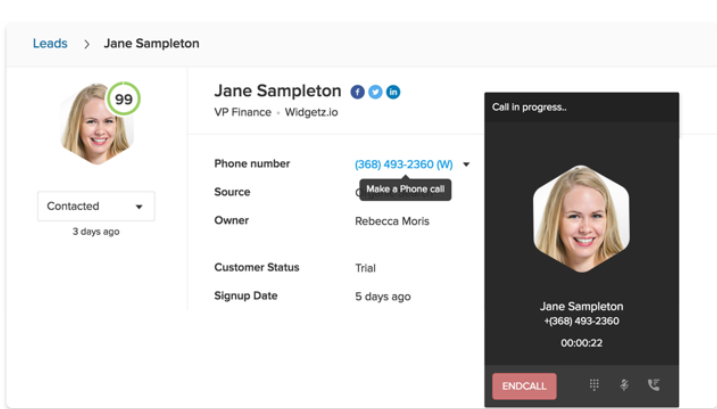 There’s even a free version that includes the built-in phone and offers basic lead and contact management functionality for unlimited users. Sprout is Freshsales’ free plan and offers helpful CRM features like a built-in phone with call recording and basic lead scoring but does not offer the more advanced features like advanced lead scoring, workflows, territory management and lead assignments found in the paid plans. Unlike other sub-niche hospitality CRMs like CaterZen, Sprout has calling features that startup hospitality companies can use right away. Additionally, hospitality companies can use the Sprout plan’s phone features for both sales and service by assigning different phone numbers by function. However, the plan is best for smaller companies with a few sales and service representatives that don’t have a need for advanced territory or segmentation management features. This plan builds on Sprout and provides more advanced CRM tools like advanced lead scoring, workflow automation, expanded bulk emails, pipeline management, and advanced reporting. It also offers call forwarding and transfers. Starting at $12 per month, per user, this plan can help hospitality companies with sales traction become more productive by using tools that keep them focused on the right leads and eliminate tasks that can be automated. Features like advanced lead scoring enhance a hospitality company’s ability to focus on the best leads. Email metrics also allow you to provide additional feedback on emails and showcase high-performing emails as best practices for the team. Freshsales’ Blossom plan is, therefore, the best option for hospitality business owners looking to take their sales to the next level by utilizing analytics. Starting at $25 per user, per month, the Garden plan expands on Blossom and includes sales rep activity reports and territory management. It also offers forecasting features, lead scoring by email activity, lead assignment rules, and expanded automation workflows. Unlike the first two plans, Garden allows you to create multiple pipelines, which is ideal for hospitality companies with multiple product and service lines or multiple sales processes. Features like territory management can help hospitality companies segment their sales teams by product or territory. It can also facilitate grouping reps by function, allowing you to create teams focused on customer service, or you can integrate with other products like Mailchimp, QuickBooks, Facebook, or Retently. This plan is, therefore, best for hospitality businesses that have scaled to the point of segmentation and specialized roles. The starting price for the Estate plan is $49 per month, per user. It offers expanded sales campaigns, lead scoring, and bulk email capabilities. It also offers auto profile enrichment, which enhances account profiles with, and additional information found on customers’ social profiles and other places on the web without manual research. Expanded sales and marketing capabilities along with the ability to auto-populate lead and account enrichment details into individual profiles help hospitality businesses scale and personalize their marketing and outreach efforts. The Estate plan is suitable for hospitality businesses with a rapidly growing customer-base wanting to scale their efforts while offering a personal touch during customer and lead interactions. Freshsales is missing industry-specific hospitality features like the delivery tracking or menu planning found in CaterZen. It also lacks project management tools which are useful for event-planning unless you integrate the system with additional third-party apps like those found in Gather. However, it also lacks the higher starting price of an industry-specific CRM. Freshsales users find it easy to use with great support. User dislikes usually fall into the category of minor glitches or occasionally, the system running slowly. For more information on reviews, see our Freshsales review page. Business owners looking for an affordable CRM with enough features to optimize sales and build relationships should consider Freshsales. Freshsales’ low cost and available integrations make it a great option for hospitality businesses of any sub-niche making, giving businesses the ability to adjust their business models as needed to serve their customers better. To learn more, visit Freshsales today and sign-up for a 30-day free trial. Gather is a hospitality CRM with tools like a calendar built for booking and tracking events as well as team collaboration tools to ensure event teams are on the same page. What makes it unique is that it auto-generates event-specific documents like BEOs and contracts that can be signed electronically. It’s ideal for event planners wanting to streamline repetitive tasks and documents so they can focus on growing their businesseses. Gather CRM’s pricing is unpublished and offered as a quote only after you have scheduled a demonstration or consultation with them. While the specific price a business is quoted depends on its needs, Gather CRM’s pricing is, on average, more expensive than a general-use CRM, but aligned with other hospitality-specific CRMs. Gather CRM makes it easy to sell, book, and manage events with event organization, event tracking, and sales management features. It helps maximize team productivity with its client portal where customers can get information about their events without the assistance of the event team. It also offers a mobile app and website so that busy event planners can plan and execute event tasks on the go. This hospitality CRM offers tools to help organize and track events. 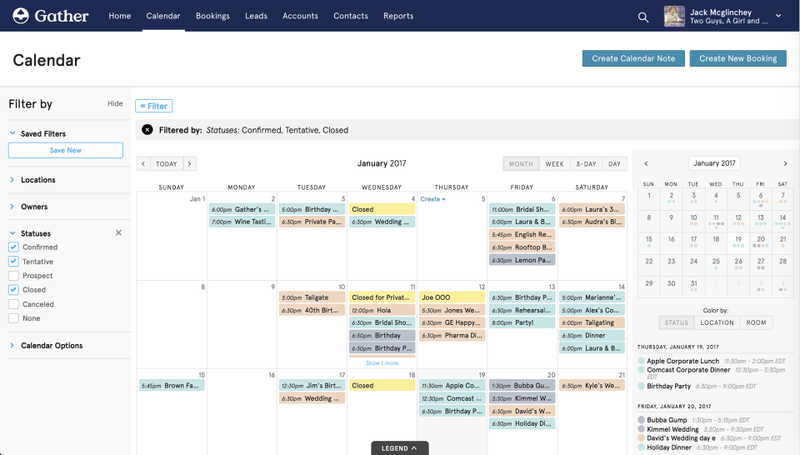 A built-in event calendar allows you to schedule events across multiple venues and rooms. You can also keep track of past and future events with the calendar. 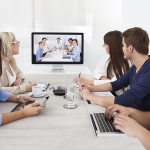 Team messaging tools also help with event organization, keeping everyone on the same page. Gather also offers event performance metrics so that you know how well your events performed. Gather offers an event inquiry widget that you can embed on your website to help you capture event leads. It sends you alerts every time you get an inquiry so that you can follow-up right away and offers tools like proposal templates with e-signature to shorten the time it takes to close event deals. There are also tools to convert leads into bookings and accept payments online easily. Gather’s mobile app and mobile website provide the ability to manage events from mobile devices. Email notifications, calendars, and messaging are synced, which lets you stay on top of events wherever you are. You’re even able to respond to lead inquiries and send proposals and contracts from your mobile device. This hospitality CRM offers a client-facing portal that provides real-time updates on events that clients can access at any time. It’s easy to navigate and houses event documents like proposals, contracts, and other event-related information. This saves sales and service teams time from having to look up and contact their clients with information provided on the portal. Caption: Gather’s event calendar screenshot. Gather is missing lead scoring and a built-in VoIP. As event planners do more lead generation, being able to score and rank leads can be critical to focus on the best event inquiries. A built-in VoIP can also help if sales and other event professionals focus on calling prospects and closing deals. Lead scoring is possible with app integration. If these features are important, consider Freshsales, which offers both lead scoring and a built-in phone. Overall, users really like Gather. They like that the solution is very easy to use, has tools that save event planners time, and offers features like an inquiry widget that helps convert website visitors into prospects submitting inquiries. Most of the dislikes were due to minor bugs and aspirational features. Gather’s mobile app and website, event and sales management tools, productivity tools and templates, and client portal makes it a terrific fit for event planners food businesses that do events and catering. Consider Gather for your event planning needs by requesting a demo. Cendyn’s Guestfolio is a boutique hotel CRM with enterprise features like the ability to offer room upgrades and amenities, automated email marketing and customer profile enrichment to smaller hotels. It also includes a mobile concierge that enables guests to plan their activities ahead of time while allowing hotels to upsell services and activities. It’s great for smaller hotels looking to use many of the marketing tools larger chains do to attract and retain guests. Guestfolio Hotel CRM’s pricing is based on individual need. However, as it does include many industry-specific features, it’s expected to be more expensive than a general use CRM. Therefore, you must contact them to schedule a demo or consultation in order to determine what their pricing is based on the functionality your specific business requires. This hotel CRM makes it easy to build relationships with professionally designed and automated emails sent both before and after a guest stays. It also simplifies the process for getting customer feedback and reviews on TripAdvisor. Room upgrades, enriched guest profiles, and repeat business incentives are among Guestfolio’s features. Cendyn’s Gestfolio offers marketing automation tools like the ability to set-up and send a series of emails to guests automatically before they arrive for their trip and after they’ve checked out. It also provides tools to enrich guest profiles using data from social channels a well as pre-arrival engagement surveys. The combination of enriched profiles and the ability to send personalized communications allow hotels to build loyalty. This boutique hotel CRM makes it easy to get guest feedback. You can send automated requests for guests to complete surveys. With its TripAdvisor integration, when guests are done completing surveys, guests are then prompted to leave online reviews. These tools provide insights to make changes or continue what’s working. It also helps you share and respond to more of your feedback publicly. The mobile concierge allows hotels to engage guests before they arrive by prompting guests to plan details of their trip, giving the hotel more insight as to how it might better serve guests during their stay. It also makes guests aware of amenities, upgrades, and services that increase the revenue of the hotel. Caption: Profile screen from Cendyn’s Guestfolio CRM. This hotel CRM is missing a built-in VoIP found in CaterZen and Freshsales. Therefore, hotels using Guestfolio may need to log in the details of calls with potential guest or track issues through another tool. It is also missing the banquet and event planning tools found in Gather. Overall, users like Guestfolio. They like the marketing and engagement tools but, sometimes, find that features like customer segmentation and adding notes to profiles are not as intuitive as they’d like. Guestfolio hotel CRM can be found on Cendyn’s website with some of its other hospitality tools. It’s ideal if you’re looking for marketing automation along with guest profile enrichment and other tools to help you make your guests feel special. 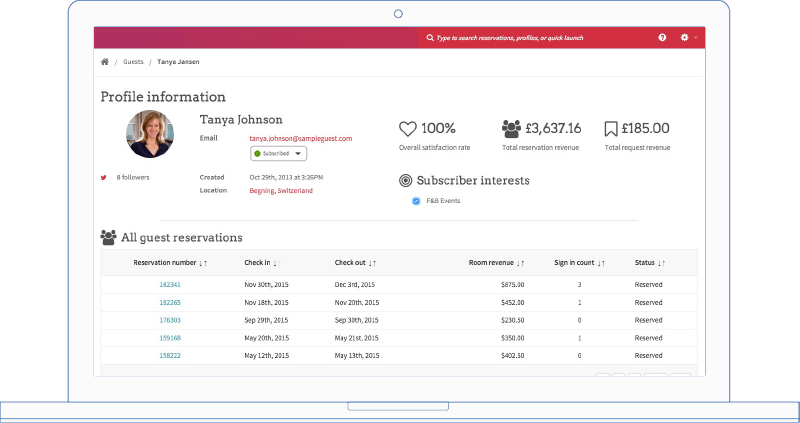 If you’re interested in these hotel CRM features, consider requesting a demo. Guestware is a hotel CRM that allows you to manage hotel operations, guest services, and customer loyalty in a single platform. Incident tracking and auto dispatch allow you to solve customer issues while shared profiles let teams personalize guest interactions. This makes it suitable for hotels wanting to centralize guest relations and operations for a more streamlined customer experience. Guestware pricing is based on the number of rooms a hotel has. There are room tiers within each plan, from 50 rooms to 500 rooms. The Select tier ranges from $112 per month to $513 per month, and the Suite tier ranges from $200 per month to $775 per month. With prices beginning at $112 per month, the Select plan features are focused on guest issue resolution and facilities management. Features in this tier allow you to document, track, and resolve customer issues immediately, providing better customer experiences and more positive feedback in surveys and online ratings. This plan allows hotel teams to work together and communicate effectively until customer issues are solved. It’s a terrific option for hotels looking for a more operations-focused or service-oriented CRM. Compared to other hospitality CRM featured, this plan offers no marketing options at the starting tier. If marketing is important when you’re starting out, Freshsales or one of the more advanced tiers may be better options. This plan starts at $200 per month and builds on the Select plan. It offers CRM and loyalty features like shared profiles and preferences that can be accessed throughout the organization. It also offers guest recognition tools and pre-arrival planning features to help differentiate loyal and special guests’ experiences. The Suite plan focuses on the soft CRM or customer experience skills that surprise and delight guests, such as rapid response to customer issues or saved preferences based on guest profiles, which encourages guests to choose your hotel in the future. This plan is ideal for hotels interested in building loyalty. The Plus plan’s pricing is only available based on quotes, and you have to contact Guestware for a demo and pricing. However, this plan builds on the first two, by adding even more customer experience and loyalty features like loyalty program management, mobile apps, email marketing, and property management and customer service integration. The Plus plan offers the tools to increase loyalty further like a guest-facing web portal and pre-arrival planning functionality. It’s great for larger hotels with multiple properties and needing tools to manage customer interactions and marketing. 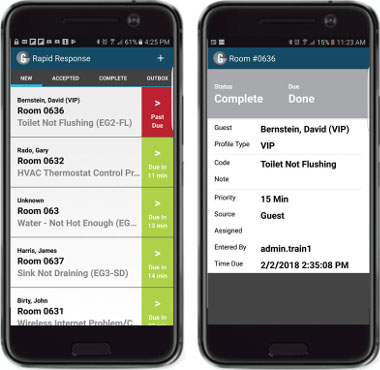 Guestware rapid response mobile app. Guestware is missing the core CRM sales-focused features like lead management and marketing tools in its starting tiers as it’s more focused on in-person relationship building at the time of service. It is also missing the order tracking functionality of CaterZen, the event planning and proposal management functionality of Gather, and the online concierge portal found in Guestfolio. Guestware users overall like the software and find that it fits their needs. Negative reviews are around the learning curve and nuances to get used to with the system. Some users also reported occasional connectivity issues with various devices they were using to access the software. If you’d like to try a hotel CRM that focuses on loyalty and the guest experience, try Guestware. Guestware includes great tools to help you build guest loyalty with a pricing model designed to serve the hotel industry. Learn more by visiting their website and getting a product demo. Revinate is a hotel CRM that focuses on marketing, reputation management, and customer feedback with surveys and reviews that include marketing and feedback plans. Unique features include creating and managing email campaigns and staying on top of guest surveys and ratings on a variety of review sites. It’s great for hotels focused on marketing and learning from customer feedback. 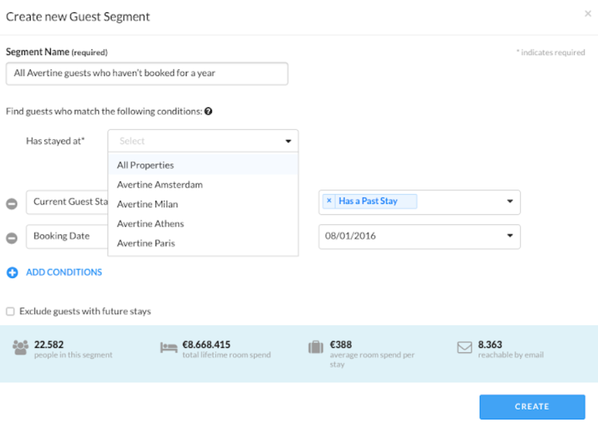 Revinate Hotel CRM has two sets of pricing plans. One for its marketing suite of tools and the other for its survey and reputation management tools. However, its rates for either suite is unpublished and only offered on a quote basis. To get pricing, you must contact them to schedule a demo or consultation. This hotel CRM makes it easy to focus on two key areas for hotels: marketing to attract and retain customers and feedback to solve customer issues and address any service trends. Specific marketing and feedback tools include email marketing campaigns, upsell tools, reputation management, post-stay surveys, and Google and TripAdvisor review management. Revinate’s email marketing tools allow you to send personalized emails and automated email campaigns. You can do A/B testing to see which campaigns work, and you can also track campaigns using analytics and reporting, which is similar to sales campaign functionality offered by Freshsales, where you can send and track email campaigns. Integration with property management systems (PMS) and enriched guest profiles allow you to access customer data to segment and create customer groups. This allows you to create campaigns and offers based on customer needs. Like Guestfolio, this boutique hotel CRM allows you to earn more revenue by offering room upgrades and amenity upsells. It also gives you the ability to add or remove offers and manage upsell requests. To stay on top of how you’re doing, the feedback and reputation management features allow you to send professionally designed post-stay surveys when guests have checked out. You can segment your surveys based on customer data. You can also design sophisticated surveys with features like conditional questions. Like the Guestfolio software, Revinate has a TripAdvisor integration that you to access TripAdvisor ratings. Revinate email marketing segmentation screenshot. This hotel CRM is missing a built-in VoIP allowing for telephone sales, automated voicemail or text message campaigns to be integrated into the system like what is found in CaterZen. It’s also missing lead scoring to help track and stay focused on the most promising prospects like what is found in Freshsales as well as the event planning tools found in Gather. Overall, users like Revinate. They find it easy to use with features that add value to their hotels. Some of the user issues revolve around various features that can be considered nice haves vs features that are missing. Revinate hotel CRM can be found on its website with both marketing and feedback focused plans. These features are terrific as feedback should shape marketing and customer experience. If you’re interested in a hotel CRM with these features, consider requesting a demo. The best hospitality CRMs are easy to use, offer tools that address the needs of sub-niches and offer enhanced customer profiles to help increase customer loyalty. Whether you’re looking for a hospitality CRM specific to your sub-niche or one that covers a broader spectrum within the hospitality industry, we’ve covered a CRM that will work for you. We chose CaterZen as the best CRM for hotel and hospitality. The software offers features that can help caterers and restaurant owners at a competitive price for the functionality. Check it out today for more information.